Lets breakdown the fastest 100 yard breast in history and compare it to the former record by Kevin Cordes of Arizona. Without question, Caeleb Dressel has one of the best starts of all-time. That includes swimmers of all events, so it isn't surprising that Mr. Dressel has an explosive start and distance off his start. He breaks the 15-m mark at ~5.17 s compared to Cordes' 5.45 s. To the 15-m mark Dressel had a velocity of 2.9 m/s compared to 2.7 m/s for Cordes. Also, Dressel is able to go beyond 15-m on his pullout (read about the breaststroke pullout rules), breaking the surface ~1.5 s later than Cordes. This extra distance allows Dressel to take one less stroke over the first 25 yards. One stroke seems small, but as you'll see, he continually takes less strokes which can conserve energy. Dressel went 10.48 seconds on the first 25 while taking only 3 total strokes (read what contributes to fast breast swimming). This is 0.06 seconds and one total stroke less than the former record. Once again Dressel has an amazing turn and pullout. He spends again ~1.5 seconds more than Cordes underwater. He actually is slower than Cordes to the 15-m mark on this lap! That was surprising to me and we can assume that was a timing error on my end, but still I think at best it is even to the 15-m mark, something we wouldn't think at first glance. During this distance, Cordes takes 2 strokes compared to only 1 stroke by Dressel. Although Dressel was slower to the 15-m mark than Cordes, he still outsplit Cordes by 0.10 seconds on the second lap. This was due to his superior surface swimming, closing the lap from the 15-m mark to the wall 0.3 faster than Cordes. They both took 3 strokes from the 15-m mark into the wall. The first 50 yards of the race went to Mr. Dressel with a remarkable 23.42 split compared to the 23.58 for the former record holder Cordes. Over this length, Dressel took 2 less total strokes and spent ~3 seconds more underwater! Their swimming velocity was similar, ~1.7 m/s (slightly higher for Dressel). Another turn, another second longer Dressel spends underwater than Cordes, 6.72 s to 5.58 s.
Over this length Dressel took 1 stroke and Cordes took 2 strokes. They both have similar times to the 15-m mark, but different strategies helped them get there. Into the wall, both swimmers have nearly identical races. They both take 3 strokes and both swim it in ~5.2 seconds. This results in both swimmers splitting 13.25 seconds on their third 25. Another turn, another opporunity for underwater pullouts for Mr. Dressel. On this lap, he relies on his underwater pullouts for a whopping 7.19 seconds, where Cordes only spent 5.36 seconds. Despite this conservation of total strokes (once again saving another stroke) he was ~0.3 seconds slower. They both took 3 strokes from the 15-m mark into the wall. Dressel was also ~5% slower to the 15-m mark over this distance. Into the wall, Dressel uses his legendary ability to finish into the wall. Dressel splits a spectacular 4.9 s split over this distance, finishing ~0.2 seconds faster over this distance than Cordes. On the last 25-yards, Cordes outsplits Dressel by 0.15 seconds. As mentioned, the first 50 yards went to Caeleb Dressel, but the tables turned on the second 50 yards. Dressel was outsplit 26.46 to 26.61. Most of this can be attributed to the last 25 yards, particularly the pullout on the last 25 yards. This 100 yard race is truly spectacular! 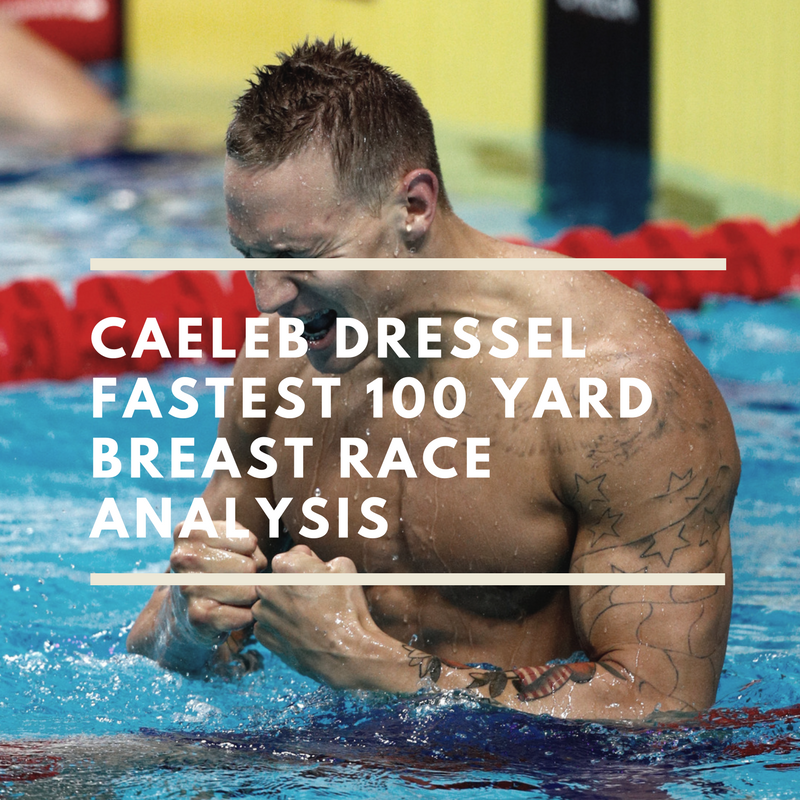 Caeleb Dressel goes the fastest 100 yard breast in arguably (I don't even think you can argue) his 3rd best stroke! Amazing start. He was able to beat Cordes by ~0.10 to the first 15-m.
Amazing turns/pullouts. Dressel spent ~6 more seconds underwater than Cordes. This is insane for a 50 second race!! (sorry, two explanation marks were needed). Dressel spent 27.62 seconds underwater compared to 21.76 seconds by Cordes. Dressel went more than 50% of his race underwater (55% of the race to be specific). Low stroke count. He took 4 less strokes than Cordes and 18 total strokes. This low stroke count allows him to finisher stronger on the last lap. Ability to maintain distance off his turn. He consistently went ~13-m off each turn (according to Kinovea). Ability to finish with remarkable velocity (1.75 m/s last 8.6 yards). Time for some fun, how can Dressel improve the fastest 100 yard breast of all-time? As noted, on his last pullout he spent 7.19 seconds, compared to 6.72 seconds on his third lap. This was ~0.1 m/s slower. I know Dressel is superb at turns (see the notes above), but he can still finish with the same speed and come up a little earlier. If he can maintain the same finishing velocity and come up earlier, he will break 50 seconds. The obvious drawback of him coming up earlier on the last turn, is he will have to take another stroke. This may cause more fatigue and offset the above assumption. His stroke count and timing of his turns and finish were fantastic (as his usually are). If he adds a 5 stroke on the last lap, this timing will differ. Nonetheless, I think his remarkable ability to finish strong would allow him to finish that last lap around 13.2 seconds and dip to a 49.8-49.9 seconds for another fastest 100 breast of all-time. Unfortunately, I'm unsure we'll see him do this race at NCAA. What do you think now, are breaststrokers born or made? 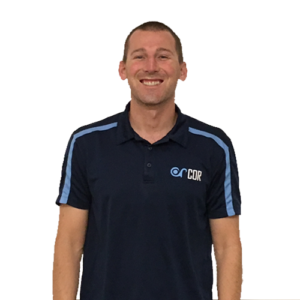 Dr. John Mullen, DPT, CSCS is a World renowned expert and speaker in sports training and rehabilitation. He received his Doctorate in Physical Therapy at USC, as well as the Josette Antonelli Division Service Scholarship, Order of the Golden Cane, and the Order of Areté. At USC, he also performed research on strength training and rehabilitation. Dr. John has worked with multiple professional and Olympic athletes, helping them earn Olympic medals. His dedication to research and individualization spurred him to open COR in 2011. Since 2011, Dr. John has been featured in Gizmodo, Motherboard, Stack Magazine, and much more. He has worked with the numerous colleges and teams regarding rehab and performance. Before his Doctoral program, Dr. John swam on an athletic scholarship at Purdue University. At Purdue, Dr. John was an Academic Honorable Mention All-American and was awarded the Red Mackey Award and R. O. Papenguh Award. He also won the Purdue Undergraduate business plan and elevator pitch competition, as well as 1st prize with the Indiana Soy Bean Alliance. Dr. John was born in Centerville, Ohio and was a 24-time high school All-American Swimmer. Dr. John is still a swimmer and holds a Masters Swimming World and Pacific Swimming Record. 1) Under will always be faster than over (see Physics/Hydrodynamics/Bernoulli/surface tension/…. 3) “Fewer”, not “less”. It is an ordinal number, not an amount.